West Yorkshire Fire And Rescue say they've dealt with 1757 deliberately set fires at unoccupied and derelict buildings in the last 5 years. It comes after crews have tackled 6 arson attacks at an old Kirklees College building in recent weeks. Between April 2015 and April 2016 derelict buildings were targeted 214 times in West Yorkshire. 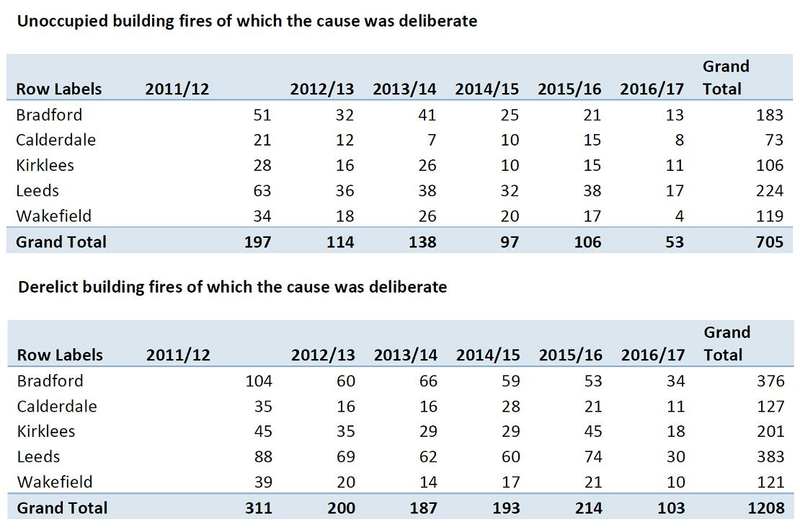 Figures also show between April and August this year they dealt with 156 deliberate fires at derelict or unoccupied buildings in the region. "When some other incident has happened, and our crews know that whilst they were dealing with this fire in a derelict or unoccupied building they could've been at another incident on their own station area - that's when the frustration starts to creep in and crews start to focus on 'what if' scenarios and what could have happened. "The fires we should be going to is where somebody has genuinely suffered some misfortune, some accident, call it what you will. The fact that we're distracted from doing those to go to some deliberate act really doesn't sit well at all with our staff. "A fire could start somewhere else, and if we're dealing with a deliberately set fire in an unoccupied or derelict building, we can't attend that other emergency as quickly as we might have done. "Arson and deliberate fires like these are a crime. It is destruction of property and we will always work with West Yorkshire Police wherever possible to secure convictions of those that have put our firefighters and the public in such unnecessary danger."